Get all four bios for the price of three! You've just been crowned king of an entire country, the Vikings are invading, and you're only ten years old. What would you do? The Story of Johannes Gutenberg correlates to Chapter 35 of The Story of the World, Volume 2. She came from obscurity to rule an empire and change the course of history. And she could do a mean backflip. The Story of Amerigo Vespucci correlates to Chapter 31 of The Story of the World, Volume 2.
Who in the World Was the Acrobatic Empress? The Story of Theodora Her wisdom and courage steered an empire–and she could do a mean backflip. Who in the World Was the Forgotten Explorer? The Story of Amerigo Vespucci Two continents were named after him. Hint: Neither one was Australia. Who in the World Was the Secretive Printer? 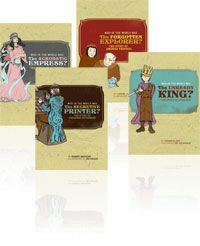 The Story of Johannes Gutenberg What was Johannes doing in his workshop? Why was he always covered in ink? And how would his secret invention change the world? How many pages are each of the books? The books range from 45 to 55 pages.